Aruba is the scuba dive mecca of the Caribbean. Many of the dive sites are located in shallow waters which range in depths of 30 to 60 feet, making the island a perfect location for both novice and advanced divers. 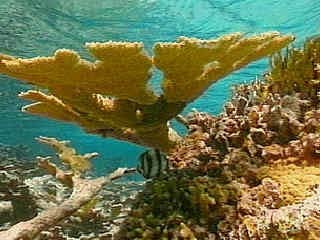 Aruba offers divers a bounty of plant and animal life, to name a few - starfish, parrotfish, stingray, tube sponges, seafans and corals... that would stretch the imagination of the most advanced diver. For those who are curious and wish to see the under water wonders and are not divers - there are other alternatives. Aruba's spectacular underwater world may be seen from a traditional glass bottom boat which takes tours every morning and afternoon to the German wreck, Antilla and Arashi coral reefs. For the more adventurous, there is the state-of-the-art Atlantis Submarine which offers exploration cruises at 150 feet below the surface on board their 46 passenger submarine. Or there is the Sea Trek. You take a walk 20 feet below the surface using a special diving helmet. Some of the world's most fascinating wrecks lie just off of Aruba's shores. One can secure a dive map from many of the island's dive operators. These maps will include some of the Caribbean's most interesting wrecks and pristine reefs to be explored. The California Wreck - surrounded by large coral formations and an abundance of tropical fish. Located off Aruba's north shore coast, this dive is for advanced divers due to the strong currents and choppy seas. The wreck is 111 years old. California was the name of a steamship shipwrecked off the wild northern coast of Aruba in the middle of the night September 23rd, 1891. The Arashi Reef - a perfect site for beginner divers or for those that have not been diving in a long time. 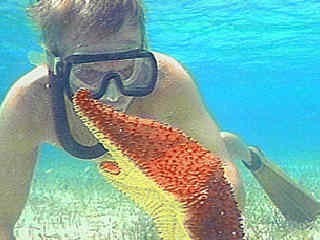 The area is home to brain coral, large star corals and many sea fans. The Antilla Wreck - locally referred to as the "ghost ship" a German freighter which was scuttled off the coat of Aruba when the Germans demanded oil from the refineries on the island. This wreck offers divers large compartments to explore along with giant tube sponges, lobster and tropical fish. The Malmok Reef - has an abundance of colored barrel sponge, along with huge lobster and stingray who inhabit this reef made up mainly of brain and leaf corals. The Pedernales Wreck - was hit by German submarine torpedo, offers divers the opportunity to swim among the remains of whole cabins of this oil tanker. It is home to grouper and angel fish and the bow and stern of this vessel was excavated and welded together and used in the Normandy invasion later in WWII. The Harbour Reef - a pleasant beginner dive. The Harbour reef is a giant slope of plant life and sea fans. The Sonesta Reef - a private dive spot home to two sunken airplanes where many forms of marine life make their home. This sandy bottomed site is surrounded by different corals. The Tugboat Wreck - one of the island's most superb dives, this site drops through brain, star and sheet coral formations to an old tugboat where sting rays and spotted-eagle rays have been close by. This thrilling dive also offers the opportunity to meet fact-to-face with two green moray eels, which "guard" the boat. The Barcadera Reef - a breathtaking seascape, this reef has an enormous amount of sea fans, waving to visitors, which give the sensation of being welcomed. The Kantil Reef - a dive site which is for the intermediate to advanced diver... this shelf dive is surrounded by gigantic boulders of brian, star, leaf and sheet coral. 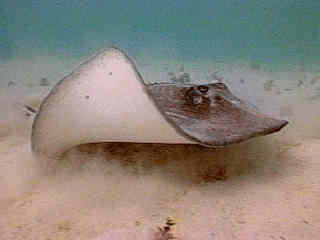 Yellow tails, morays, grouper, manta and eagle rays all make this an excellent subject for the photographer. The Natural Bridge Dive - Majestic boulders rise from the depths of this incredible dive site off the shoreline of the world-famous Natural Bridge. See black and soft corals along with giant barrel sponges. This dive is only for the most advanced diver due to strong currents and rough waters. 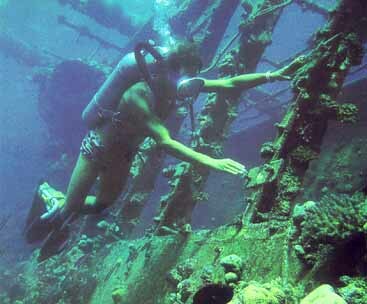 In all told there are some 23 documented reefs and ship wrecks directly off the coast of the island of Aruba. To repeat myself again - Aruba is the scuba dive mecca of the Caribbean. From the depth range of twenty feet to that of one-hundred and ten feet of water to take your pick. A scuba divers dream come true.